40"x32" (100cm x 80cm) Turkish ceramic tile set. Set is consist of 20 1/4" thick 8"x8. Main colors on this tile are light and dark blue. They can be molded on the wall or framed. 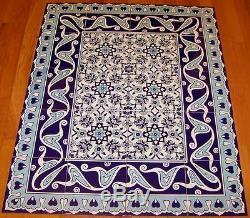 These tile is decorated with Ottoman/Seljuk floral designs. There are 2 center design options for this border design (same border for all 2, just center tiles are different). This tile is decorated with 16th & 17th century Ottoman Iznik floral designs. These tiles has a layer of glaze on them and they can be used at moist areas. White-yellow area on the picture are due to light reflection. 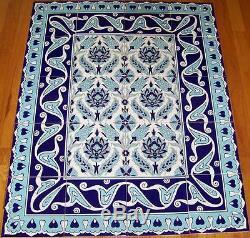 The item "Blue & White Iznik Floral Pattern Border 40x32 Ceramic Tile Panel Mural" is in sale since Monday, February 11, 2013. This item is in the category "Home & Garden\Home Décor\Tile Art". The seller is "anatoliancarpetsandartifacts" and is located in Dalton, Georgia. This item can be shipped worldwide.